Shedding a bit of light on the myth that kids are forced to stay home longer. Housing affordability is one of those issues that is often plagued by more emotion than fact. And I get that. Your housing situation speaks to how secure you feel in the world. You have every reason to get emotional about it. It’d be strange if you didn’t. But still, a few facts never hurt anyone. 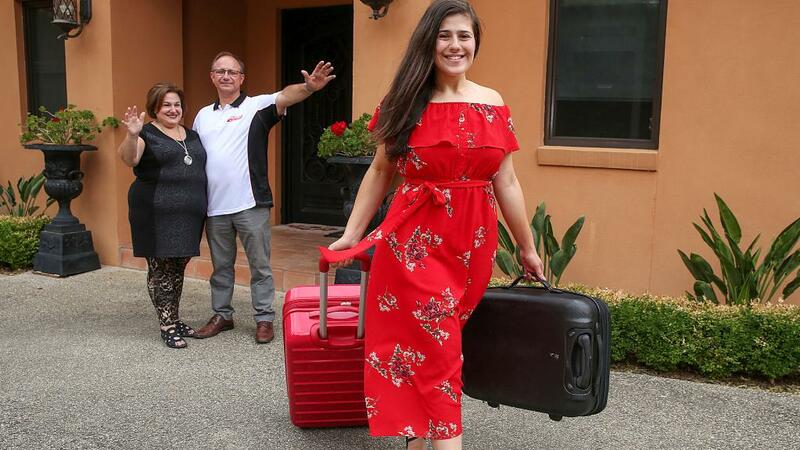 So one of the stylised facts that gets bandied about is that kids have no hope of buying a house on their own, and so are staying at home longer. This is putting pressure on the whole family unit, as parents are forced to balance up the needs of the children with the need to have a new entertainment room and their life back. But the interesting thing about this is that it just doesn’t seem to be true. That’s what the latest Census data are showing us. 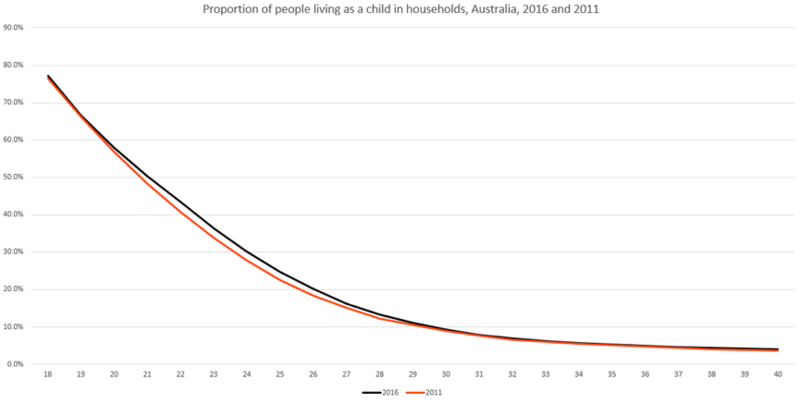 This chart from demographers .id, shows the proportion of people in each single year of age from 18 to 40 years old, who are living in a household, with a relationship in that household being “Non-dependent child”. In other words, they are still living at home with one or more parents. The figures for 2011 are in orange. 2016 is in black. Now if you can see a difference between the two, you’ve got better eye-sight than I do. There has been a slight increase. In the 2011 Census, 41.4% of 20-24 year-olds were still living with parents. By 2016, this had risen 2% to 43.4%. The equivalent figures for 25-29 year-olds rose from 15.7% to 17.0%. So it’s nudging up. But we’re hardly talking about an epidemic of kids unable to fly the nest. What is interesting though is what happens when the kids do leave home. Increasingly, they’re not buying their own place, they’re renting. The proportion of 20-somethings renting rose 3% from 58.9% in 2011 to 61.8% in 2016. It is very unlikely that this is about preference. It’s much more likely to be about affordability. For example, in regional areas, where housing costs are much cheaper, kids move out earlier and more of them are home-owners. This chart compares the stay at home rates for regional kids and city kids. So the story that emerges here is that kids aren’t staying at home longer, but they are renting more than they used to, and owning less. One of the things we have to ask ourselves is, do we care? I mean, sure, it’d be great if young people could buy their own house, but as long as they’ve got a roof over their heads, is there really that much of a problem? And young people have been renting for generations, so why is it such a fraught topic these days? I think the key to understanding why it’s become such a hot-button topic is ‘location’. Sure young people can rent at a reasonable price and strike out on their own. They can also buy. But the question is where? I think the key issue is that young people simply aren’t able to buy, and increasingly rent, where they’d like to. Now I’m not saying that they’re having a whinge and of course we’d all like to live in Double Bay with harbour views. Location isn’t just about amenity and access to cafes. It’s also about access to employment opportunities, and connection to your community. It is a hard story if the only viable housing options for you are a two hour commute away from work. And it is sad if you can’t afford to buy in the suburb you grew up in. It’s sad for you and it’s sad for your parents who yes, would like you to find your own place, but don’t want to have to pack three-days worth of food into the Landcruiser if they want to go and visit you and see the kids. It’s hard to build community and keep it vibrant if your young people have to move away all the time. So yeah, that’s the light I want to shed on this debate. When we’re talking about an affordability crisis, we’re not saying that kids can’t find accommodation, or that kids are having to stay at home longer than they used to. However, it is true that kids find it tough to live where they want to live, and that affects the entire community. Have your kids been able to buy where they want to live?